Tags: Arabidopsis thaliana (L.) Heynh. Lacy Samuels, Geoffrey Wasteneys, and Heather McFarlane share their research on plant cell wall development. Heather McFarlane, an undergraduate honours student, with Lacey Samuels and Geoffrey Wasteneys (UBC Botany), are researching the formation of cell walls in the plant, Arabidopsis thaliana. Specifically they are looking at the mechanisms by which pectin is secreted to a particular domain within the seed coat cells of Arabidopsis. The first photo (bar=10 µm) shows the 5-6 sided mature seed coat cells and the second photo (bar=2µm) shows a cross section of a developing seed coat cell at 7 days post-anthesis (anthesis occurs when the anthers dehisce and is the only reliable point from which to measure time since fertilization). In the middle of each mature cell is a deposit of secondary cell wall surrounded by a ring of mucilage. In the developing cell, the central column is not yet secondary wall material but instead cytoplasm (c), containing amyloplasts (a), surrounded by the mucilage (mu), and just below the cytoplasm, the vacuole (v). Pectin, a polysaccharide essential for the formation of primary cell walls in plants, is an important constituent of mucilage. In the area of the cell membrane that is most active in pectin deposition, there are abundant cortical microtubules. 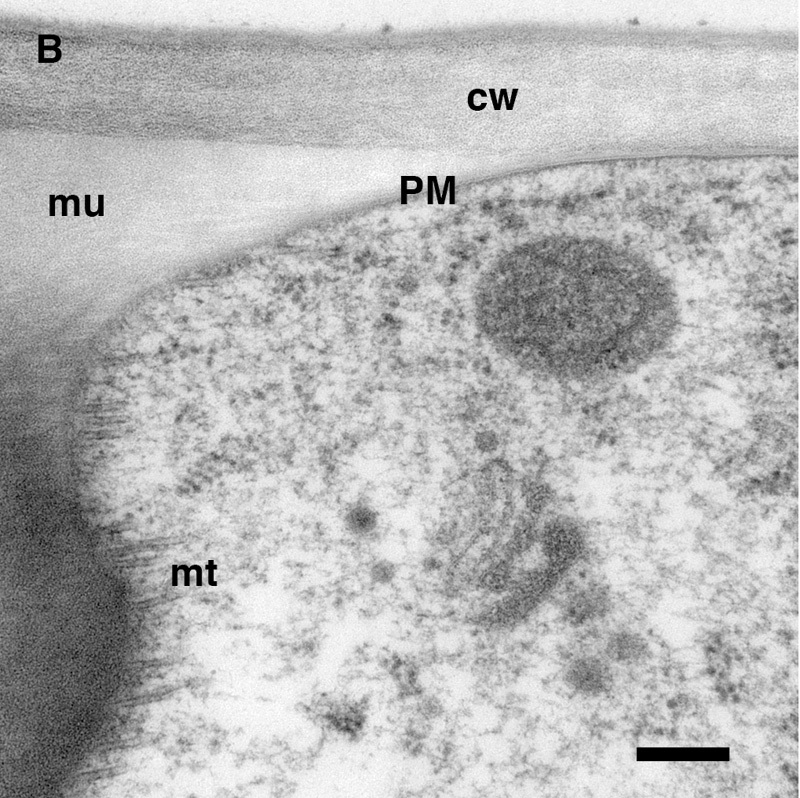 The third photo (bar=300 nm) shows these microtubules (mt) where the plasma membrane (pm) meets the mucilage pocket (mu). Cortical microtubules are required for deposition of cellulose microfibrils in the cell wall their function in this secretory system is unknown. 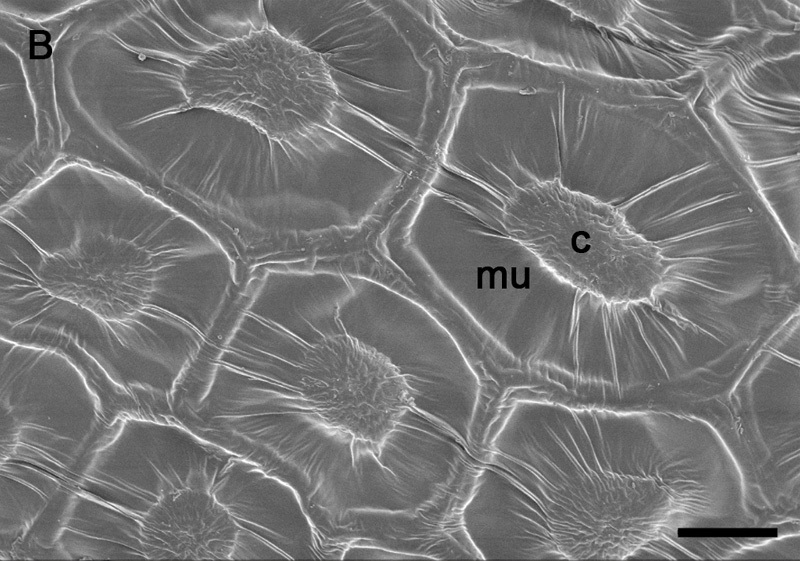 Samuels and Wasteneys hypothesized that these microtubules are important for the proper placement of pectin secretions. To test this hypothesis, they looked at the sites of pectin secretion in the seed coat cells of a temperature-sensitive mutant Arabidopsis that contained disorganized microtubules. However, secretion was not disrupted in the the mutant seed coat cells. This observation suggests that the cortical microtubules fulfill a role other than guiding pectin secretion during seed coat development. 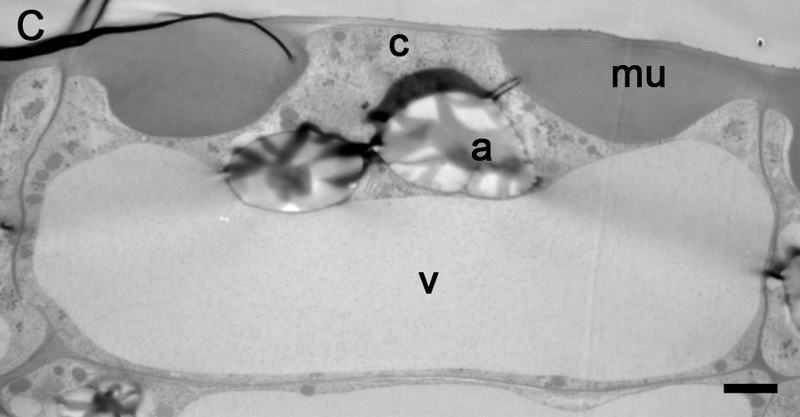 The first image was taken using scanning electron microscopy; the second and third were taken using cryofixed cells and transmission electron microscopy.